The BMW i3 is offered by the company's car-sharing service. SEATTLE -- Six months after shutting down its San Francisco car-sharing pilot due to a lack of help from city government, BMW is restarting its program here with 370 cars, added services and a new name: ReachNow. The reboot shows that BMW, like rivals such as Daimler AG and General Motors, wants to strengthen its hand in the burgeoning field of mobility services, in which customers pay by the minute or by the trip to get around. Although the main focus of ReachNow is point-to-point car sharing, BMW’s reworked program also will offer customers a chauffeured ride, akin to ride-sharing services Uber and Lyft. ReachNow, headquartered in Seattle, will not be confined to the Pacific Northwest tech hub forever. Schwarzenbauer will announce that BMW plans to add three more U.S. cities in 2016 and eventually expand to 10 cities in North America. Like Car2Go, a car-sharing program owned by Daimler that operates in a dozen North American cities, ReachNow will offer the ability to pick up a car on the street and park in any legal curbside spot near the driver’s destination, rather than in reserved parking spaces. ReachNow will also offer cars at Seattle’s primary airport. Parking spots were the main reason BMW shut down its San Francisco program, DriveNow, which operated from 2012-15. San Francisco, unlike Seattle, would not offer the company “superpermits” allowing shared cars to be parked in legal parking spaces for free without having to abide by time limits. DriveNow, formed in tandem with the European car-rental company Sixt, still operates in European cities such as Berlin, Copenhagen and Vienna. 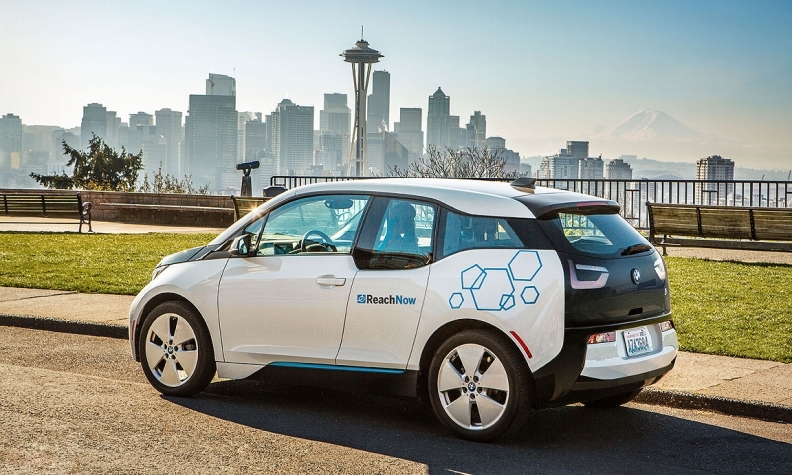 ReachNow will have a fleet of 370 cars in Seattle, including BMW 3 Series sedans, all-electric BMW i3 city cars and Mini Cooper hatchbacks. Car2Go expanded its Seattle fleet to 750 vehicles in early 2015. As another option, ReachNow will offer to deliver vehicles to customers at their desired time and location. And in a novel twist, Mini owners will be allowed to rent their personal vehicles using the ReachNow app, similar to the peer-to-peer rental services offered in certain U.S. cities by the startups Turo and Getaround. ReachNow runs on an app iOS and Android devices. Customers pay a lifetime fee of $39, which is being waived for early Seattle customers. It costs 49 cents per minute while driving, and 30 cents per minute while parked. For longer loans, users pay a flat fee of $50 for three hours, $80 for 12 hours, and $110 for a full day.